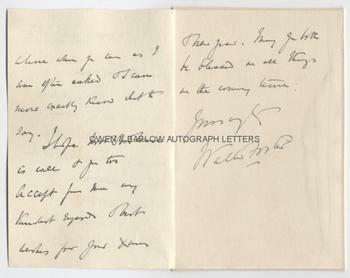 SIR B. WALTER FOSTER Autograph Letter Signed. British [English] physician, politician and public health reformer. ALS. 3pp. 30 Grosvenor Road, Westminster, S.W. July 10th, no year. To Dr Woodhouse. 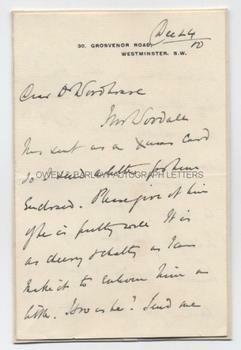 "Mr Woodall has sent me a Xmas card so I enclose a letter for him enclosed. Please give it to him if he is fully well. It is as cheery and chatty as I can make it to enliven him a little. How is he? Send me a line when you can as I am often asked and I can more exactly know what to say. I hope Mrs Woodhouse is well and you too. Accept from me my kindest regards and best wishes for your Xmas and New Year. May you both be blessed in all things in the coming time." 12mo. Approx 6.25 x 4 inches. Laid down by last leaf onto card from album leaf, else fine. Sir Balthazar Walter Foster (known as B. Walter Foster or just Walter Foster) was professor of anatomy at Queen's College, Birmingham. On the merger of Queen's and Sydenham Colleges in 1868 he was appointed professor of medicine, a post he held until 1892. He was an anti-traditionalist in the practice of medicine and was galvanized by what he described as "a new atmosphere of modern thought and scientific enterprise". He carried out research into treatments for peptic ulcers, valvular heart disease and cyanosis. He was the first to publish a text covering premature death of diabetics from ketoacidosis. The research for which he is best known concerns his use of diethyl ether in the treatment of phthisis. He became an M.P. in 1885 and was a tireless worker for better housing for the poor. He became president of the National Liberal Federation and, as Secretary to the Local Government Board, he became the first doctor to hold a Cabinet post. In that office, he organised a programme of sanitation that prevented the 1893 cholera pandemic from reaching Britain. The letter is from a 19th century collection made by the radical Liberal M.P., William Woodall.